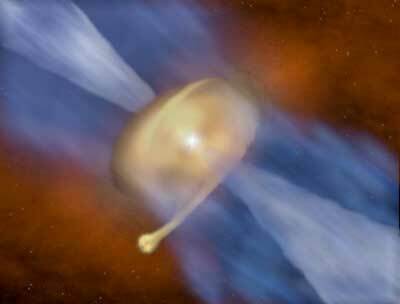 (Nanowerk News) Astronomers have captured one of the most detailed views of a young star taken to date, and revealed an unexpected companion in orbit around it. Their work, published in the Astrophysical Journal Letters ("G11.92-0.61 MM1: A Fragmented Keplerian Disk Surrounding a Proto-O Star"), found MM 1a weighs 40 times the mass of our Sun. The smaller orbiting star MM 1b was calculated to weigh less than half the mass of our Sun. 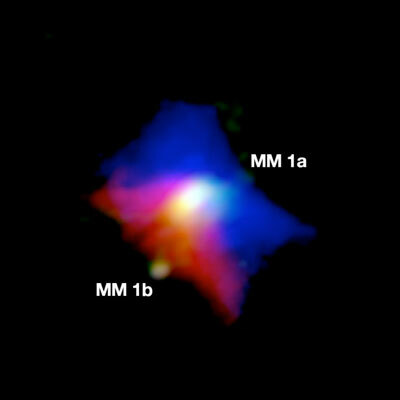 The favoured formation process for MM 1b occurs in the outer regions of cold, massive discs. These "gravitationally unstable" discs are unable to hold themselves up against the pull of their own gravity, collapsing into one - or more - fragments. The researchers note that newly-discovered young star MM 1b could also be surrounded by its own circumstellar disc, which may have the potential to form planets of its own - but it will need to be quick. The astronomers made this surprising discovery by using a unique new instrument situated high in the Chilean desert - the Atacama Large Millimetre/submillimetre Array (ALMA). The team have been granted additional observing time with ALMA to further characterise these exciting stellar systems in 2019. The upcoming observations will simulate a telescope that is 16km across - comparable to the area inside of the ring-road surrounding Leeds.